Some of the choir seem to be in even more of a pre-concert tizzy than usual. There’s always the excitement of working with the orchestra – but so little time to adjust from Lydia’s sensitive and helpful playing on Monday evenings. Despite weeks of hard work, some of the Schubert still looks totally unfamiliar – and yet those are our pencil markings on it! And Steven said this was a challenging programme. All nerve-racking stuff! Taking deep breaths to calm down and now it’s beginning to make sense. The different tones and timbres of the various instruments underpinning the choral parts, pulling it all together; several mistakes, but potential trouble spots are noted, and we know the adrenalin will give us a lift this evening. 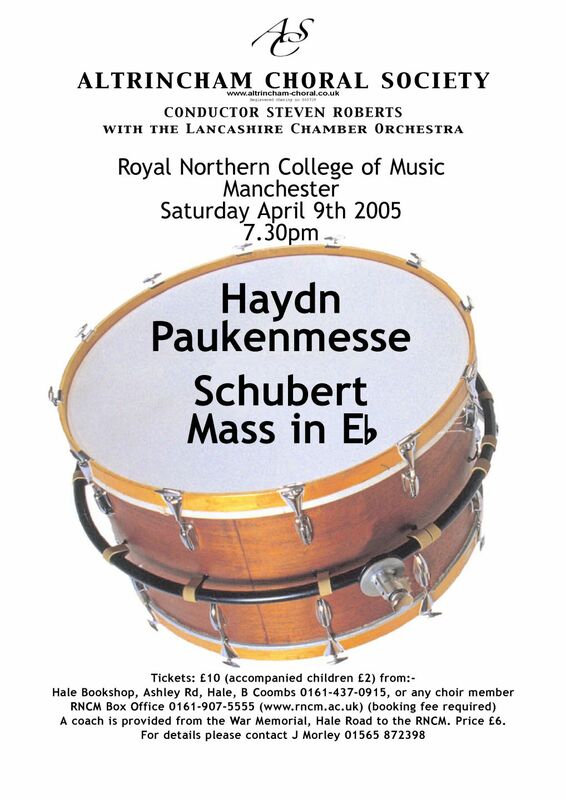 Scene 2 – RNCM – The performance. And it does! The choir pulls out all the stops. Highlights for me were the terrific build-up in Haydn’s Credo with the sequential B-T-A-S entries, later mirrored in the Benedictus for the soloists with sounds tumbling from high to low. Then the exciting Et Resurrexit and Et Vitam and in both works all those Hosannas! We’d all been concerned about the Schubert, especially the fugal sections, but we held it together (mostly!) and the chromatic sections sounded great. I found singing the Schubert a marvellous experience, and the Et Incarnatus Est by the soloists was particularly moving. How can four young people make such wonderful music? It’s over and the general feeling seems to be “Didn’t we do well!” – confirmed by loud applause and enthusiastic audience reactions. One ACS member, unable to sing on the night, said it was “a terrific performance”; another listener “a balanced sound and rich harmony”. A first-timer told me she “hadn’t realised that ACS were so good”. Well, now she knows! We’re all waiting to hear Steven’s verdict. “Very pleased – all the complexities of the music were highlighted by the singers and players, and the choir’s dynamic contrasts were excellent – especially in the quiet sections!” That’s a real compliment. We feel good. All that practice and pre-performance anxiety has been worthwhile. So – thanks to everyone involved in making this such a memorable concert evening. And now on to the next one. See you there!